Place all ingredients in a Vitamix or other high-speed blender and blend until smooth. Enjoy! I served mine in my favorite heart bowl — can get yours here. Celery is perfect for post workout as it replenishes the lost electrolytes and rehydrates the body with vitaminsA, B1, B2, B6 and C, and minerals: potassium, calcium, folate, magnesium, iron and sodium. It may also help reduce inflammation as it is highly alkalizing in the body, effectively balancing the body’s pH by neutralizing acidity. Apple — OK, I think we very well know the benefits of apples — high in fiber, vitamins, anti-oxidants, apple has well deserved what it is touted for: “An apple a day keeps the doctor away”. Buy it organic and eat the skin! Almond milk — a delicious alternative to dairy, almond milk is alkalizing in the body due to its high mineral profile, and is also rich in vitamin E (for naturally beautiful glowing skin! ), healthy fats and fiber. 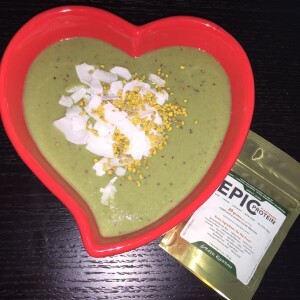 Epic Protein: one of the cleanest protein powders on the market, Epic Proteins has a complete amino acid profile with a balanced ratio of BCAAs for optimal protein synthesis. My favorites are the vanilla lucuma and chocolate maca, though today I opted for the Green Kingdom for extra nutritional benefits from the supergreens. Bee Pollen is a true superfood for achieving optimal health and therefore becoming a better athlete. It is abundant in enzymes, vitamins, minerals, anti-oxidants, phytonutrients, and protein (bee pollen is 25% protein! ).